EVestG is the shorter trade name for electrovestibulography, a new diagnostic technique that could diagnose depression in an hour flat, according to inventor Brian Lithgow. A biomechanical engineer, he refers to the device as a "ECG for the mind". Lithgow worked with psychiatrists from Monash University to see if it is possible to identify the unique electrical signals of mental illnesses like depression, schizophrenia, Parkinson's, Alzheimer's and bipolar disorder. The inventor claims that the device can successfully determine the nature of a disorder before it has manifested in obvious symptoms. The device does not require that a physician operate it; the procedure can be done by a medical technologist. The university is working with a corporate partner to market the technology, calling it EVestG, rather than the more descriptively polysyllabic "electrovestibulography". To see how it works, watch this surprisingly detailed explanatory video. "This could be one of the most significant inventions ever to come out of Monash. CNS disorders cost upwards of $US2 trillion globally and affect one in four people sometime in their lifetime. At present, diagnosing these conditions is done almost exclusively by qualitative measures, through questions and interviews, and it can take many years for sufferers to be correctly diagnosed." If you're a Star Trek fan, you might be thinking of the psychotricorder, a special version of the tricorder technology that is programmed for use by psychiatrists. 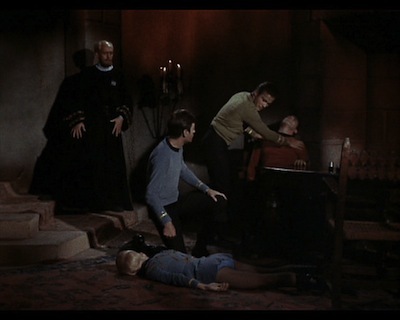 The psychotricorder did not require that Dr. McCoy operate it; a medical technician performed the examination. The psychotricorder scanned the patient's brainwaves during questioning and diagnosed mental illness immediately. The device was used in an original series episode Wolf in the Fold, first aired in 1967. In the story, Scotty was an apparent victim of amnesia. From Science Daily; thanks to Moira for the tip and the reference.